Maren belonged to an old family line that's had roots on the Wear farm for more than 200 years. Her father was the son of Joen Ingebretsen Flater, born 1723,6 who descended from Ingebrigt Joensen, born 1687,7 who owned part of the Wear farm ca. 1700, and in 1777 dissolved into another part of the farm, he owned a total of 1 skp. 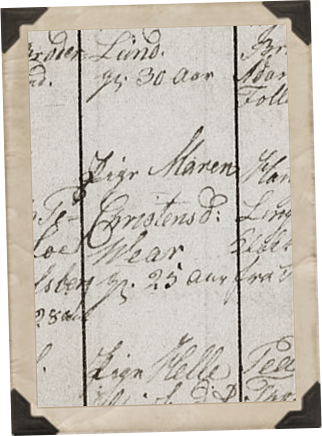 18-1/4 lispd.A Joen's two sons Christen Joensen (Maren's father), born 1759, and Ingebret Joensen, born 1761, took over in 1789 after their father. In 1838, Hans Engebretsen, the son of Ingbret Johnsen, owned 12 lisp. 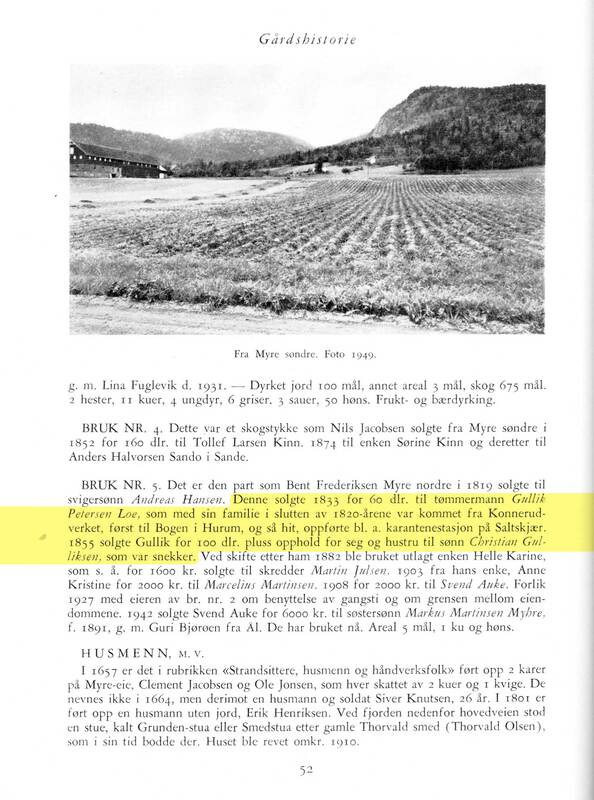 As of 1900 there were still descendants of Ingebrigt Joensen on the farm. On 27 Oct 1825, the day after Maren's birthday, she was married in Røyken church to Gullik Petersen Loe "from Jarlsberg Verk”. It was noted that both Maren and Gullik had survived contracting smallpox. “Gullik is physically scarred and Maren lost one eyeB from fighting smallpox,” is mentioned in the church book. Maren's her best man was Hans Jonsen Lingsom from Royken, while Gullik had the clerk of Skoger, H.G. Allum.10 H.G. is described as the most famous clerk the village has had. He was a diligent writer, and states that he had more of a desire to write than keep up with school. He wrote a poem for the wedding. After they were married, the couple was noted to be living at Loe: a parcel of land by Veierud and Knatholt that was still called Loe to this very day (the time of Sigfred's account in 1942), probably after a Gudbrand Loe, who lived on Knatholt first in the 1700s. In 1847, Christen C. Loe is mentioned as one of the tenant farmers under Eikholt. 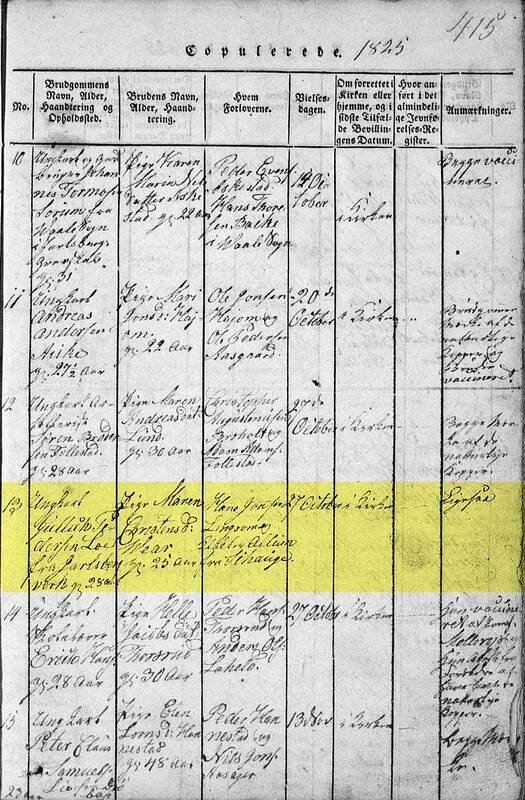 Maren on 1865 Norway Census"About my grandmother (Maren), I do not know much to say. She eventually became blind in both eyes. The last eye she lost by an accident while living in Bogen (under Hov farm in Hurum). The youngest of her children were born after she had lost sight. She died several years after my grandfather." 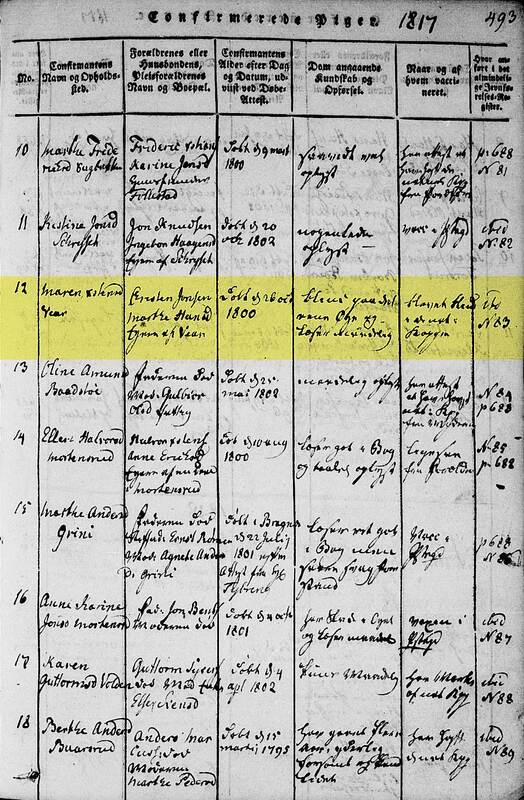 EMANUEL, born 14 Feb 1835 22, was 13 year old at Rød farm in Hurum, disclosed in school register for Strømmen. Emanuel took to sea as a mate and married in Oslo with Marie Dorthea Johnsdatter.23 Together they had three children: Inga Emilie, who married Ole Barthsen (see later), Johan worked at Langaards Tobaksfabrik and Kristian. GUSTAVUS “GUSTAV”, born 1 Feb 1846 in Strommen.25 He is listed in the 1865 census as living with his sister, Mathea in Svelvik. He was a sailor. Gustav died in England when he fell into the frigid waters between the dock and the vessel and drowned. He is depicted as a pretty handsome fellow. He was almost finished with mate school when he passed away (would have been around 20 based on similar relatives graduations from mate school). Of the children, only Ingeborg we have real knowledge of. Ingeborg is described by her daughter, Ragna Gunnersen of Drammen, as a tall and beautiful woman. She entered service with the ship owner Borch in Drammen and on 2 Aug 1868 in Stromso married NILS RASMUSSEN,26 born in Royken, on the 6 Feb 1847.27 He was a chief engineer at Holmens Bruk for 45 years, and died 4 Nov 1923.28 Ingeborg died on the 16 Jan 1903.29 She was spent the last 20 years of her life suffering for a heart condition. They had the grief of losing their first four children as minors, namely Inga Marie, Gustava Anette, Reinert and Anna. This was followed by INGA, born 10 January 1876, (lives with her sister Ragna), GUSTAVA, born 29 July 1878, died on 27 January 1930, and RAGNA, born 18 January 1880. Gustava married a master shoemaker (cobbler) Henrik Kristiansen in Drammen, born 2 May 1869, died 20 June 1940. Three children: Gudrun Jeanette, born 29 August 1902, “Reidar” Christoffer, born 29 April 1905, co-owner of Norløffs Hardware Business A/S, married Inger Eriksen, and Ella, born 18 December 1906, employed in the linen shop. Ragna married 22 November 1901 with the carpenter Ole Sauthon Gunnersen, born 10 September 1882 in Sigdal. He died 29 January 1906. Two children: “Sigrun” Ingeborg, born 9 February 1903, married to the telegraphist Roar Jansen from Sundland pr. Drammen, and Erling “Gunnar”, born 18 September 1905, Office of shipowner Karl Bruusgaard, married Hard Olsrud, from Jevnaker. Ragna Gunnersen, since her husband died, was employed as a cashier and bookkeeper. In the last 20 years she has been employed by Ad. Hægg, Gjaerfabrikken (Yeast Factory) and Danvik, where she still is. She has taken prominent part in society life in Drammen, including as chairman of the Drammen Female Commercial Association, as deputy chairman of the Professional Women's Club and as treasurer and secretary of Drammen's women's association. Emanuel Gulliksen, 14 Feb 1835 – ? Gustavus "Gustav" Gulliksen, 01 Feb 1846 – ? A Skp=skippund, Lispd=lispund (1 skippund = 20 lispund = 160 kg grain). The size of a farm was measured in the yearly rent the farmer had to pay (in goods) the landowner. B This mark noted in the parish register probably means smallpox cost Maren part of her vision and that she went blind in one eye, not that she was physically missing an eye. C Based on this information, its more than reasonable to assume that any reference to Gullik and Maren at Jarlsberg Verk or Eikholt is not a menion of exact location of residence, but more a general description of where they lived... like stating the county you were from or a larger nearby town instead. This would explain why he is still going by Gullik Petersen Loe after he seems to leave Loe after marriage for "Eikholt" and then return as Loe years later, yet still go by Loe when he lives on Myre in Svelvik. That wouldn't happen unless it was a significant portion of his life, of who he was, was at Loe farm. It's likely he actually lived there for the first 10 years of marriage, possibly longer. D Major cholera pandemics are documented to have swept thru Europe starting in early 1832 and less severely continued through 1849. When someone mentions "Cholera times" in the 1800's, it is in reference to 1832 and the following year or so after the pandemic. E Relocation occurred sometime between the summers of 1831 and 1834 (Mathea born early 1831 in Skoger). On 5th of November 1834 was Gullik Pettersen Loe at [Myhre] submitted to the local court by worker Anders Andersen in Strømmen for missing pay, 6 daler, 1 ort and 12 skilling. The negotiations were delayed because Gullik was sick. December 3rd 1834 the case settled. The wage would be paid. F “Forlikskommisjon” is the first court instance with no judge, just a commission to try to find an agreement between the parties without using the court system. * Konnerud records are listed in the Skoger parish register. G Christian had a son Martin. He was cook at sea. He settled in America (Cleveland). In the mid war period he married Julie, daughter of a ship carpenter Anderas Johansen (of page 17). She left in 1900 over to her husband with her two children, a boy Kristian and a girl Martha. She died over there. If Kristian lives, are not known. Martin is dead for several years ago. His mother was from Stokke in Hurum, died of Tuberculosis. H After fact checking and research, I can say it's completely coincidence but, on the property that was once "Egholt" / Eikholt farm, there is now the Eikholt Center for the Blind ... Maren Christensdatter Wear also was blind in one eye while she lived at Eikholt and went completely blind shortly after she left. 1 Norway Parish Registers, Baptism Records about Gullik Petersen; The National Archives of Norway: The Digital Archives; Oslo, Norway; (http://www.arkivverket.no/URN:kb_read?idx_kildeid=8488&idx_id=8488&uid=ny&idx_side=-59); Visited:31 Jan 2014 ; Buskerud county, Eiker, Parish register (official) nr. I 9 (1789-1806), Chronological list 1794, page 113; Entry No. : 5. 2 1801 Norway Census about Gullik Petersen; The National Archives of Norway: The Digital Archives (Digitalarkivet); Oslo, Norway; (http://digitalarkivet.arkivverket.no/ft/person/pf01058275001026); Visited:31 Jan 2014 ; Buskerud county, Eiker, Census of 624P Eiker, Entry No. : 17-22; Household No. : 3, Residence No. : 48. 3 Norway Parish Registers, Baptism Records about Elen Maria Petersdatter; The National Archives of Norway: The Digital Archives; Oslo, Norway; (http://www.arkivverket.no/URN:kb_read?idx_kildeid=8488&idx_id=8488&uid=ny&idx_side=-59); Visited:31 Jan 2014 ; Buskerud county, Eiker, Parish register (official) nr. I 9 (1789-1806), Chronological list 1803, page 412; Baptism Entry No. : 2. 4 Norway Parish Registers, Confirmation Records about Gullik Petersen; The National Archives of Norway: The Digital Archives; Oslo, Norway; (http://www.arkivverket.no/URN:kb_read?idx_kildeid=8489&idx_id=8489&uid=ny&idx_side=-179); Visited:31 Jan 2014 ; Buskerud county, Eiker, Parish register (official) nr. I 10 (1806-1815), Confirmation records 1808, page 782; Entry No. : 30. 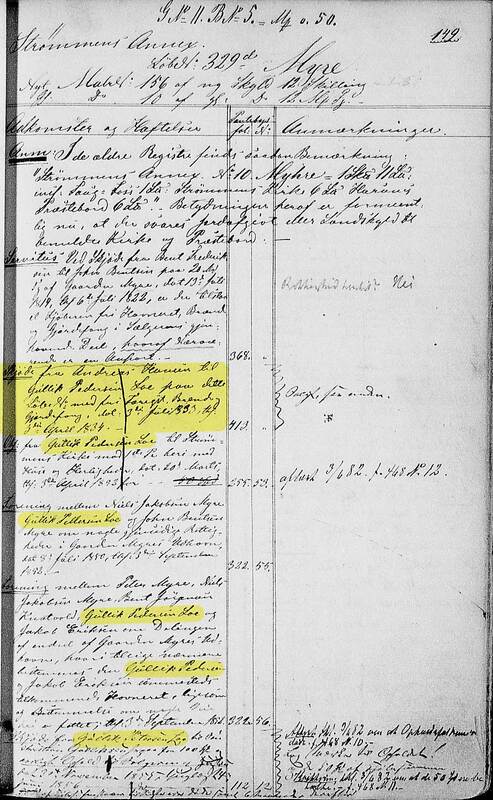 5 Norway Parish Registers, Baptism Records about Maren Christensdatter; The National Archives of Norway: The Digital Archives; Oslo, Norway; (http://www.arkivverket.no/URN:kb_read?idx_kildeid=8422&idx_id=8422&uid=ny&idx_side=-89); Visited:31 Jan 2014 ; Buskerud county, Røyken, Parish register (official) nr. 3 (1782-1813), Birth and baptism records 1800, page 86; Entry No. : 3. 6 Norway Parish Registers, Baptism Records about Joen Ingebretsen; The National Archives of Norway: The Digital Archives; Oslo, Norway; (http://www.arkivverket.no/URN:kb_read?idx_kildeid=7739&idx_id=7739&uid=ny&idx_side=-36); Visited:31 Jan 2014 ; Buskerud county, Røyken, Parish register (official) nr. 1 (1701-1730), Birth and baptism records 1723, page 34; Entry No. : 12. 7 Norway Parish Registers, Death & Burial Records about Ingebret Joensen; The National Archives of Norway: The Digital Archives; Oslo, Norway; (http://www.arkivverket.no/URN:kb_read?idx_kildeid=8420&idx_id=8420&uid=ny&idx_side=-177); Visited:31 Jan 2014 ; Buskerud county, Røyken, Parish register (official) nr. 2 (1731-1782), Death and burial records 1765, page 175; Entry No. : 9. 8 Norway Parish Registers, Death & Burial Records about Joen Ingebretsen; The National Archives of Norway: The Digital Archives; Oslo, Norway; (http://www.arkivverket.no/URN:kb_read?idx_kildeid=8420&idx_id=8420&uid=ny&idx_side=-131); Visited:31 Jan 2014 ; Buskerud county, Røyken, Parish register (official) nr. 2 (1731-1782), Death and burial records 1732, page 129; Entry No. : 5, right pg. 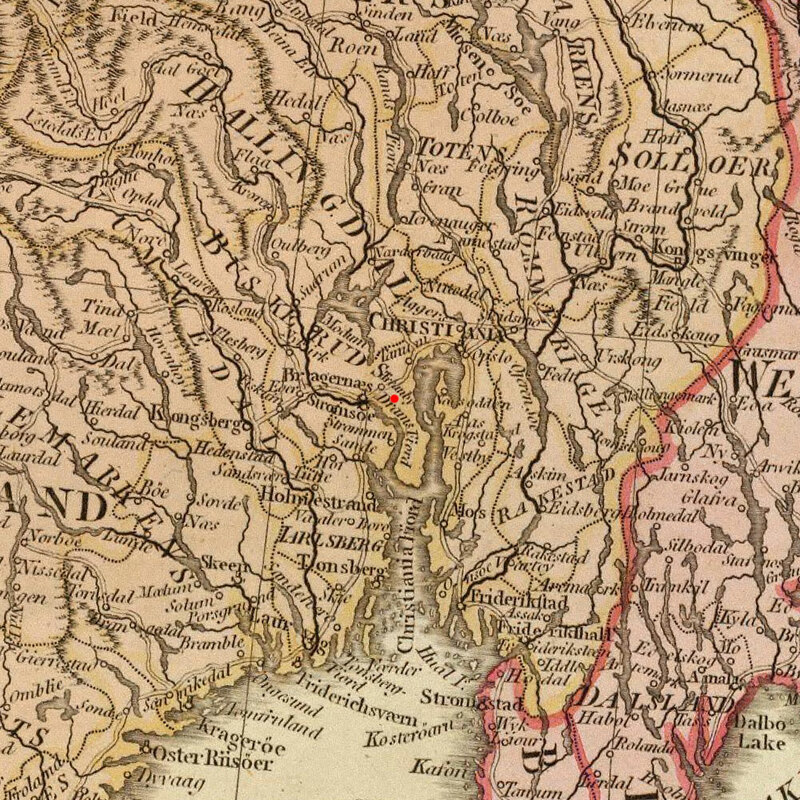 9 Norway Parish Registers, Court Records about Ingebret Flater; The National Archives of Norway: The Digital Archives; Oslo, Norway; (http://arkivverket.no/URN:rg_read/29198/39/); Visited:31 Jan 2014 ; Buskerud county, Lier, Røyken og Hurum sorenskriveri, Tingbok 1 (Fa 0001), 1655-1658, State Archives in Kongsberg; page 37. 10 Norway Parish Registers, Marriage Records about Gullik Pedersen & Maren Christensdatter; The National Archives of Norway: The Digital Archives; Oslo, Norway; (http://www.arkivverket.no/URN:kb_read?idx_kildeid=8423&idx_id=8423&uid=ny&idx_side=-134); Visited:31 Jan 2014 ; Buskerud county, Røyken, Parish register (official) nr. 4 (1814-1832), Marriage records 1825, page 407; Entry No. : 13. 11 Norway Parish Registers, Baptism Records about Petronelle Gulliksdatter; The National Archives of Norway: The Digital Archives; Oslo, Norway; (http://www.arkivverket.no/URN:kb_read?idx_kildeid=8123&idx_id=8123&uid=ny&idx_side=-35); Visited:31 Jan 2014 ; Buskerud county, Skoger in Skoger, Parish register (official) nr. 2 /1 (1814-1842), Birth and baptism records 1826, page 69; Entry No. : 16. 12 Norway Parish Registers, Baptism Records about Christian August Gulliksen; The National Archives of Norway: The Digital Archives; Oslo, Norway; (http://www.arkivverket.no/URN:kb_read?idx_kildeid=8123&idx_id=8123&uid=ny&idx_side=-39); Visited:31 Jan 2014 ; Buskerud county, Skoger in Skoger, Parish register (official) nr. 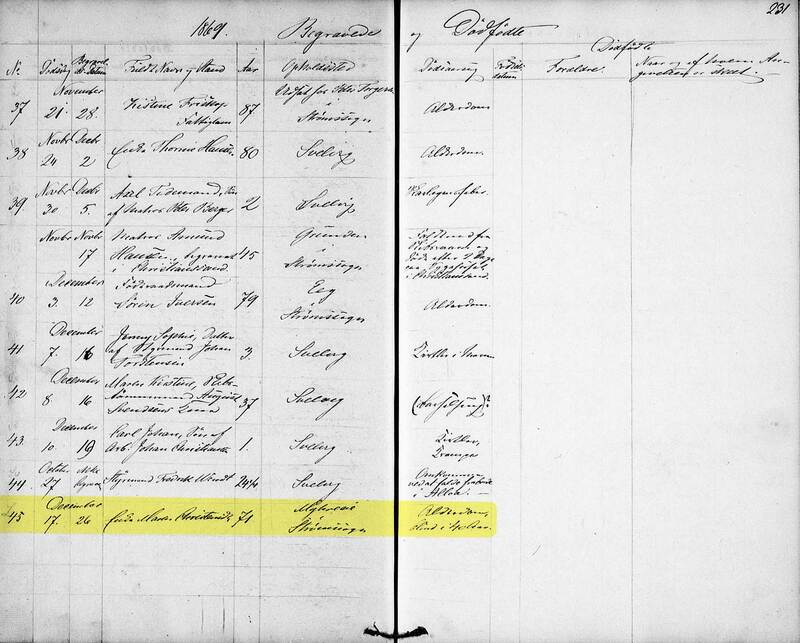 2 /1 (1814-1842), Birth and baptism records 1828, page 76; Entry No. : 10. 13 Norway Real Estate Registers, Property Records about Veierud & Knatholt under Eikholt; The National Archives of Norway: The Digital Archives; Oslo, Norway; (http://www.arkivverket.no/URN:tl_read?idx_id=14997&uid=ny&idx_side=-229); Visited:31 Jan 2014 ; Buskerud county, Skoger, Protocol number: IV 8, Place: Nordre Jarlsberg sorenskriveri, Skoger tinglag, Location: SAKO; page 210; Residence No. : 202 & 204. 14 Norway Real Estate Registers, Property Records about Myre farm in Svelvik; The National Archives of Norway: The Digital Archives; Oslo, Norway; (http://www.arkivverket.no/URN:tl_read?idx_id=15013&uid=ny&idx_side=-101); Visited:31 Jan 2014 ; Protocol number: VI 1, Place: Nordre Jarlsberg sorenskriveri, Strømm, Svelvik tinglag, Location: SAKO; page 149; Residence No. : 329d. 15 Norway Land Property Tax List, about Myre farm and Gullik Petersen Loe; The National Archives of Norway: The Digital Archives; Oslo, Norway; (http://www.arkivverket.no/URN:tl_read?idx_id=15013&uid=ny&idx_side=-101); Visited:31 Jan 2014 ; Vestfold county, Jarlsberg's and Laurviks county, Cadastre, 1838, gr: National Archives; page 9; Farm No. : 156; Residence No. : 329d. 16 Norway Parish Registers, Death & Burial Records about Gullik Petersen Myre; The National Archives of Norway: The Digital Archives; Oslo, Norway; (http://www.arkivverket.no/URN:kb_read?idx_kildeid=1095&idx_id=1095&uid=ny&idx_side=-329); Visited:31 Jan 2014 ; Buskerud county, Hurum, Parish register (official) nr. 11 (1847-1860), Death and burial records 1856, page 342; Entry No. : 11. 17 1865 Norway Census about Maren Christensdatter; The National Archives of Norway: The Digital Archives (Digitalarkivet); Oslo, Norway; (http://digitalarkivet.arkivverket.no/ft/person/pf01038108000419); Visited:31 Jan 2014 ; Vestfold county, Strømmen, Census of 0711P Strømm, Entry No. : 004; Farm No. : 056. 18 Norway Parish Registers, Death & Burial Records about Maren Christensdatter Myre; The National Archives of Norway: The Digital Archives; Oslo, Norway; (http://www.arkivverket.no/URN:kb_read?idx_kildeid=1273&idx_id=1273&uid=ny&idx_side=-205); Visited:31 Jan 2014 ; Vestfold county, Strømm, Parish register (official) nr. 1 (1861-1869), Death and burial records 1869, page 231; Entry No. : 45. 19 Norway Parish Registers, Marriage Records about Petronelle Gulliksdatter; The National Archives of Norway: The Digital Archives; Oslo, Norway; (http://www.arkivverket.no/URN:kb_read?idx_kildeid=1068&idx_id=1068&uid=ny&idx_side=-116); Visited:31 Jan 2014 ; Buskerud county, Bragernes, Parish register (official) nr. III 2 (1854-1865), Marriage records 1860, page 112; Entry No. : 36. 20 "Forfedrene Og Vi" by Sigfred L. Eier. Published in Svelvik, Norway in 1942. 21 Norway Parish Registers, Baptism Records about Mathea Gulliksdatter; The National Archives of Norway: The Digital Archives; Oslo, Norway; (http://www.arkivverket.no/URN:kb_read?idx_kildeid=8123&idx_id=8123&uid=ny&idx_side=-44); Visited:13 Jan 2014 ; Buskerud county, Skoger in Skoger, Parish register (official) nr. 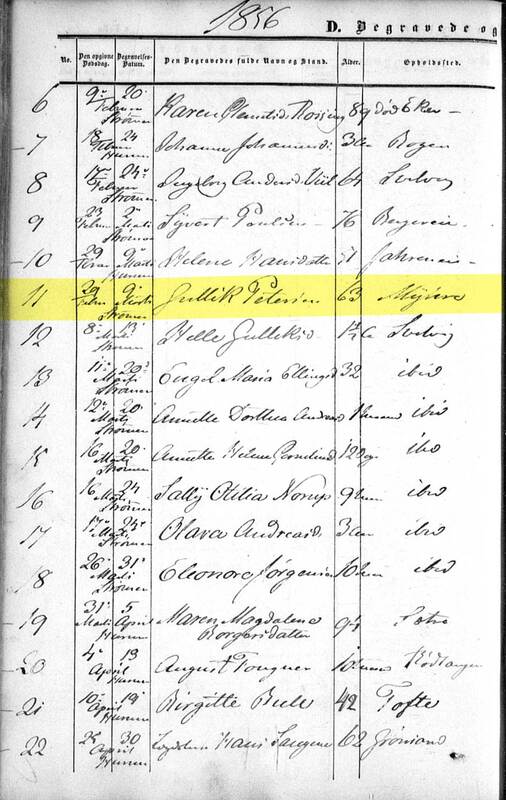 2 /1 (1814-1842), Birth and baptism records 1831, page 87; Entry No. : 11. 22 Norway Parish Registers, Baptism Records about Emmanuel Gulliksen; The National Archives of Norway: The Digital Archives; Oslo, Norway; (http://www.arkivverket.no/URN:kb_read?idx_kildeid=8433&idx_id=8433&uid=ny&idx_side=-101); Visited:13 Jan 2014 ; Buskerud county, Hurum, Parish register (official) nr. 10 (1827-1846), Birth and baptism records 1835, page 97; Entry No. : 34. 23 Norway Parish Registers, Marriage Records about Emmanuel Gulliksen; The National Archives of Norway: The Digital Archives; Oslo, Norway; (http://www.arkivverket.no/URN:kb_read?idx_kildeid=663&idx_id=663&uid=ny&idx_side=-89); Visited:31 Jan 2014 ; Oslo county, Oslo Domkirke / Vår Frelsers menighet, Parish register (official) nr. 21 (1865-1884), Marriage records 1869, page 83; Entry No. : 32. 24 Norway Parish Registers, Baptism Records about Ingeborg Gulliksdatter; The National Archives of Norway: The Digital Archives; Oslo, Norway; (http://www.arkivverket.no/URN:kb_read?idx_kildeid=8433&idx_id=8433&uid=ny&idx_side=-158); Visited:13 Jan 2014 ; Buskerud county, Hurum, Parish register (official) nr. 10 (1827-1846), Birth and baptism records 1841, page 154; Entry No. : 56. 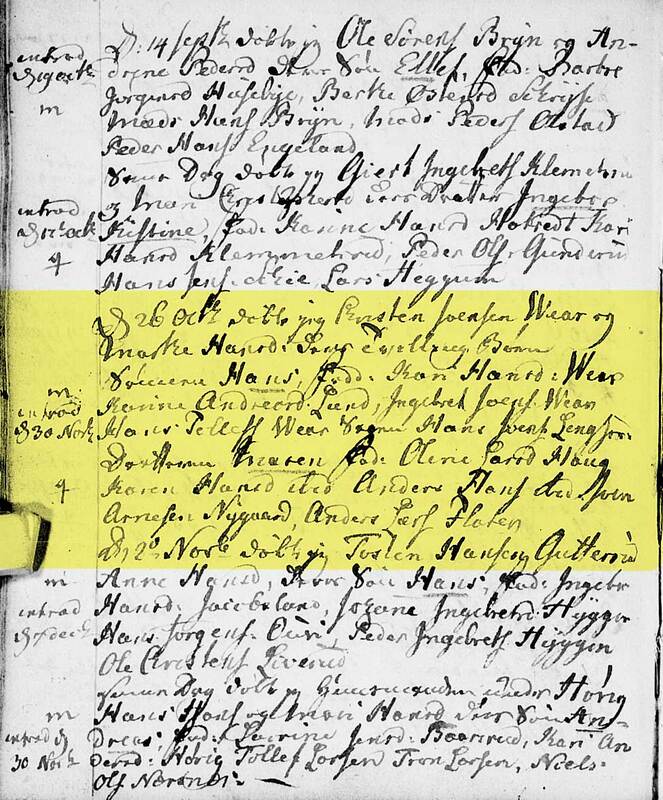 25 Norway Parish Registers, Baptism Records about Gustavus Gulliksen; The National Archives of Norway: The Digital Archives; Oslo, Norway; (http://www.arkivverket.no/URN:kb_read?idx_kildeid=8433&idx_id=8433&uid=ny&idx_side=-195); Visited:13 Jan 2014 ; Buskerud county, Hurum, Parish register (official) nr. 10 (1827-1846), Birth and baptism records 1846, page 191; Entry No. : 44. 26 Norway Parish Registers, Marriage Records about Ingeborg Gulliksdatter; The National Archives of Norway: The Digital Archives; Oslo, Norway; (http://www.arkivverket.no/URN:kb_read?idx_kildeid=5907&idx_id=5907&uid=ny&idx_side=-133); Visited:31 Jan 2014 ; Buskerud county, Strømsø, Parish register (official) nr. I 18 (1865-1878), Marriage records 1868, page 130; Entry No. : 25. 27 Norway Parish Registers, Baptism Records about Nils Rasmusen; The National Archives of Norway: The Digital Archives; Oslo, Norway; (http://www.arkivverket.no/URN:kb_read?idx_kildeid=1122&idx_id=1122&uid=ny&idx_side=-74); Visited:13 Jan 2014 ; Buskerud county, Røyken, Parish register (official) nr. 5 (1833-1856), Birth and baptism records 1847, page 64; Entry No. : 16. 28 Norway Parish Registers, Death & Burial Records about Nils Rasmusen; The National Archives of Norway: The Digital Archives; Oslo, Norway; (http://www.arkivverket.no/URN:kb_read?idx_kildeid=4842&idx_id=4842&uid=ny&idx_side=-65); Visited:31 Jan 2014 ; Buskerud county, Strømsø in Strømsø, Parish register (official) nr. 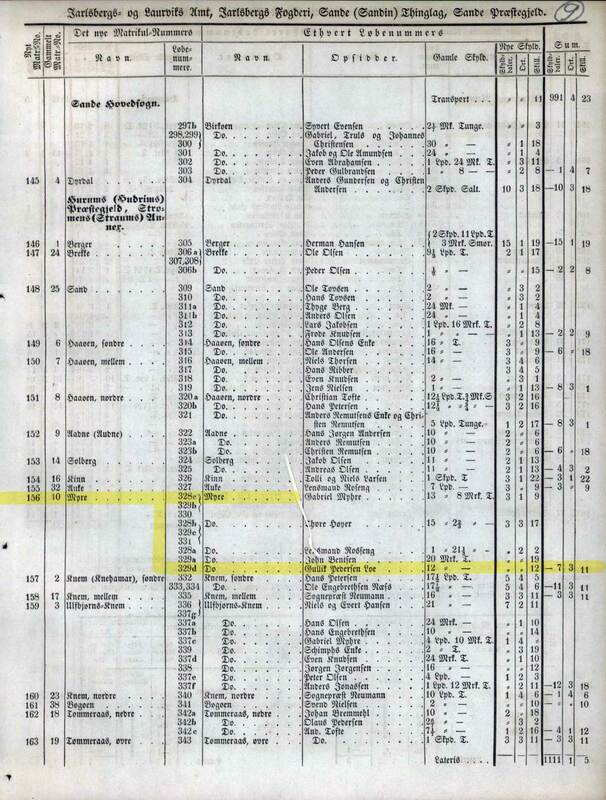 I 28 (1914-1937), Death and burial records 1923, page 66; Entry No. : 39. 29 Norway Parish Registers, Death & Burial Records about Ingeborg Gulliksdatter; The National Archives of Norway: The Digital Archives; Oslo, Norway; (http://www.arkivverket.no/URN:kb_read?idx_kildeid=4207&idx_id=4207&uid=ny&idx_side=-389); Visited:31 Jan 2014 ; Buskerud county, Strømsø in Strømsø, Parish register copy nr. 3 (1894-1904), Death and burial records 1903, page 383; Entry No. : 5.